On Sunday, September 2, the feast of the Holy Prophet Samuel and the Synaxis of the Saints of Moscow, Eastern American Diocesan vicar Bishop Nicholas of Manhattan celebrated Divine Liturgy in the Synodal Cathedral of the Sign in New York City. 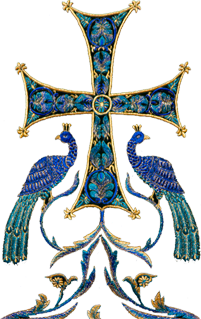 His Grace was co-served by the cathedral’s senior priest, Archpriest Andrei Sommer, and clerics: Archpriest Edward Chervinsky, Protodeacon Nicolas Mokhoff, and Deacon Pavel Roudenko. Liturgy was celebrated under the aegis of Protectress of the Russian Diaspora, the Kursk Root Icon of the Mother of God. The Holy Church continues to celebrate the Dormition of the Mother of God, and praying before her holy shroud came numerous faithful. Many of them received Christ’s Holy Mysteries. Singing at the Divine Liturgy was the Synodal Choir under the direction of Peter Fekula. "Today at Liturgy we heard from the Gospel from Matthew. The Lord tells his disciples a parable about how a certain lord arranged a marriage feast for his son and invited guests, and it was time for the invited to attend the feast. But the king called his servants and asked them to go and personally invite the already invited guests. However, the invited refused to come. And again, the king sent servants and asked even more zealously for the guests to come, saying that everything was prepared for a feast. But the guests refused to come, claiming they were busy. And the servants who came to invite them were bound and killed. The king was angry, and sent other servants to invite everyone to the solemn marriage feast. This is the first part of today’s Gospel reading. The king is God, and He prepares this feast in honor of His Son. And before us is the altar table in the sanctuary. It is deeply symbolic. The altar is consecrated before every service. To prepare it for the Divine Liturgy, special prayers are read in the evening and in the morning. 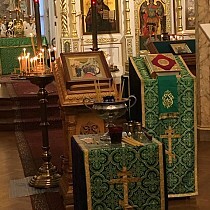 And the fact that the altar is quadrangular is a sign that people from all corners of the world are invited to the Divine Liturgy – to participate in the Eucharist. And it is terrible and shameful that we do not come and we do not abide among those who celebrate with the Lord. "What does the second part of the Gospel reading tell us? The king himself comes to the wedding feast and notices one person who is not wearing wedding clothes. In the old days in Judæa, when guests were invited, they were sent special clothes, which they had to wear on the day of the feast. And so the king, noticing a man who did not consider it necessary to put on this wedding dress, expels him." Pointing to this theme of the Gospel readings, His Grace reminded the believers that "we received the Orthodox Faith, received a baptism of light clothes, a new life. We came out of the baptismal font light, new, joyful." "The Lord gives us this garment – the grace of the Holy Spirit. If during our life we ​​are unworthy to wear this special bright clothing, then we, too, like the man who came to the reception uninhabited, will be naked. God forbid that we hear a terrible voice from above, and that we leave the feast, because we came unworthily dressed. And how do we dress? With humility, with repentance, with prayer, with the forgiveness of all those who offended us. Thus, we will put on the image of an Orthodox Christian, we will already participate here in the meal not only physically, but with the mind and the servant. We will honorably celebrate this spiritual feast of the Lord, and rejoice with the Lord not only on this earth, but also in eternal bliss." Then Bishop Nicholas told parishioners about where the Kursk Root Icon will be going, as well as about its pilgrimage to Russia, which will begin on September 18. The holy icon will return to the cathedral on feast of the Protection of the Most Holy Theotokos – October 14. In the cathedral hall, the sisterhood arranged a traditional meal for clergy and parishioners.